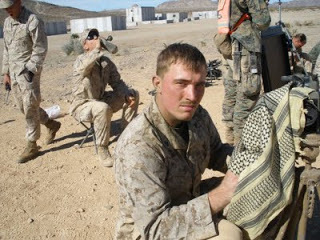 Dakota Meyer, a United States Marine Corps veteran has been approved to receive the Medal of Honor. In October 2010, the Marine Corps nominated him for his actions during the Battle of Ganjgal on September 8, 2009, part of Operation Enduring Freedom in Kunar province, Afghanistan. “He will be the first living Marine recipient of the nation’s highest award for valor since now-retired Sgt. Maj. Allan Kellogg received the medal for actions 41 years ago in Vietnam. He charged into a kill zone on foot and alone to find three missing Marines and a Navy corpsman, who had been pinned down under intense enemy fire in Ganjgal, a remote village near the Pakistan border in violent Kunar province. In interviews with Marine Corps Times in November, he said he felt “like the furthest thing from a hero” because he did not find his fellow Marines alive. “The 22-year-old’s heroics came while serving with an embedded training team from the III Marine Expeditionary Force out of Okinawa, Japan. In September 2009, his team was ambushed in the controversial battle of Ganjgal, which claimed the lives of five Marines and nine Afghan allies. Last month, two other Marines from that fight — Capt. Ademola Fabayo and Staff Sgt. Juan Rodriguez-Chavez — received the Navy Cross for their heroics evacuating wounded comrades and repelling the enemy ambush. But Corps officials said Meyer’s heroics went even further. He was wounded by shrapnel early in the battle, but when his unit lost contact with three Marines and a Navy corpsman pinned down by enemy fire, Meyer fought his way down a mountainside alone to their position.